The EJF just held a conference in Jerusalem. There, a video was aired where R' Elyashiv called for the dismantling of the Rabbanut's Conversion Authority. Many readers will remember that in May I wrote that a pro-R' Elyashiv group called the The Vaad HaRabbonim Haolami LeInyonei Giyur was strong within the EJF, and that they were also trying to manipulate the Rabbanut itself to accept their particular standards. 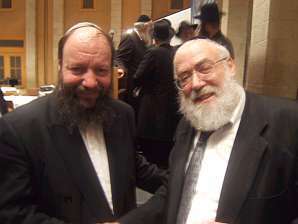 This article spells it out, and includes a grat picture of RNE with R' Moshe Klein, Deputy Director of the Conversion Authority (R' Klein is the one with the knit yarmulke). This will give me the opportunity to continue my posts on giyur 'standards'. The issue sorta died after the RCA-Rabbanut agreement. I'm glad that the hostile takeover failed.